FREE. THE FIRST FRIDAY OF EVERY MONTH. 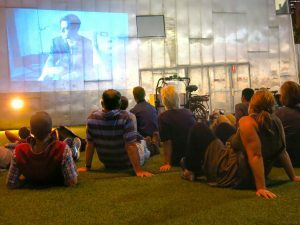 Projector Bike has a new home; Site Works at Saxon Street in Brunswick. Come down and meet your local cycling community, and join us on a Projector Bike group ride packed with award winning short films, adventure, and music as we roll! This is a free fun family friendly event for everyone. Just bring your bicycle. Want people to put this event in their calendar? Click here for embed code for your website. If you listed this event, we sent you an email with a link that allows you to update it. If you want to edit this event but you don't have that email handy, click here for a replacement email. Proudly powered by WordPress with custom software by CBDWeb. Hire us as your webmasters.